The research for this extensive, two volume project. represents a comprehensive effort to establish a complete context from which the sport of bodybuilding arose. 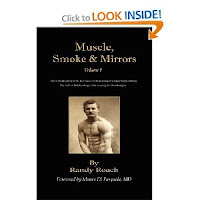 "Muscle, Smoke and Mirrors" is the rise and fall of what was truly once an extraordinary discipline associated with a term known as "Physical Culture". Experience what bodybuilding was originally and learn just exactly what "Physical Culture" really is. See what growing philanthropic power flexed its financial and political muscles to foster its corporate agenda, compromising human health internationally. Read how the merger of technology and politics culminated in the industrialization, commercialization, federalization, internationalization and finally the STERILIZATION of a nation's food supply, rendering it suspect not only to the general public; but also to the most elite of athletes. Whether you are a novice, an elite bodybuilder or simply sports-nutrition minded, learn how the emerging forces of the Iron Game evolved. Ultimately, the factions of this industry would grow powerful and manipulative while fighting for control over the Game. It took the running of several parallel histories on bodybuilding, nutrition, supplements and the role of drugs to offer a complete, first-time unraveling of the web of confusion and politics that still permeates the sport into the 21st century! Volume I of "Muscle, Smoke and Mirrors" is truly the untold stories surrounding "Bodybuilding's Amazing Nutritional Origins." 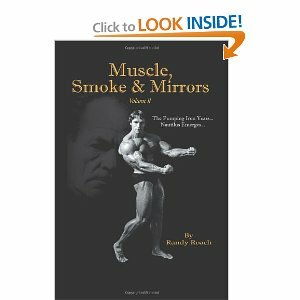 Muscle Smoke & Mirrors I & II are without a single doubt the best historical volumes I own! When I first heard Randy Roach was penning three volumes titled Muscle Smoke & Mirrors I was very suspicious and doubtful. Randy is known for his views on nutrition and the “Whole Food” movement. My belief was the authors stated and well documented attitudes on nutrition and athletic diet would undoubtedly tilt his view of bodybuilding history. I was mistaken, Randy has done a masterful job of laying out the historical time line of Bodybuilding with great detail and flair! Volume II ends just at the moment in time when I first became aware of the world of bodybuilding so all of the events were still quite fresh and new. The telling of history in these books is shockingly close to the versions I remember going on around me. The telling of Arthur Jones involvement in the development of bodybuilding and fitness is as good and accurate here as in any of the biography I've read. Arnold may have been the best Bodybuilder in the world, but A.Jones was the man responsible for the multi-billion dollar fitness industry. In short Muscle Smoke & Mirrors I & II are the THE BOOKS to read to get a good historical overview of Bodybuilding from inception to approximately 1980.